Melt the chocolate according to the package. After the chocolate has been melted, dip the Snyder’s of Hanover® Pretzel Rods into it, covering at least half of the pretzel rod. 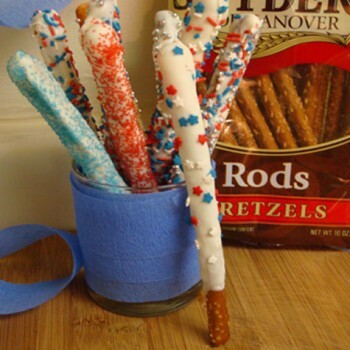 Sprinkle dipped pretzel rods with blue and red toppings. Drizzle additional chocolate onto the pretzel rod if desired. Place on the cookie sheet and let set until the chocolate is firm.